The Firstgear Kilimanjaro Glove is a comfortable, full-service and full-gauntlet glove with style with the protection of carbon fiber knuckle covers and wrist strap. The leather palm gives you complete throttle feel while the thumb visor blade squeegees away what Mother Nature has thrown at you. I was looking for an inexpensive glove, so my ratings are about where I expected. Not a bad glove by any means, but the protection on the knuckles is off a bit. But my biggest gripe is that there is a split in the underside of the gauntlets, so there is a gap when used over the jacket sleeve where water could get in. Its a waterproof glove....... Haven't used them in the rain yet, so i could be wrong. For the money though so far they work. I have only worn these a couple of times and switching from all leather gloves to these was a bit of a gamble but boy am I glad I did. I haven't felt the 34 degree mornings on my fingers at all. They do seem to fit a bit snug and I am hoping they get broken in after a summer of riding but right now they are tight. The knuckle guards seem to ride not quite on the knuckles and that can be a bit irritating for now but we shall see how they work out at the end of a season. All in all.... as far as weather protection... I give it 5 stars for sure! Have had these for a short time now and have been on a couple of 2-3 hour rides so far. Hands are snug but comfortable and fit well over the cuffs of the Firstgear Kilimanjaro Jacket. Hands and wrists feel great in 40°F weather, not too warm yet not cold even after a couple hours on back country roads. 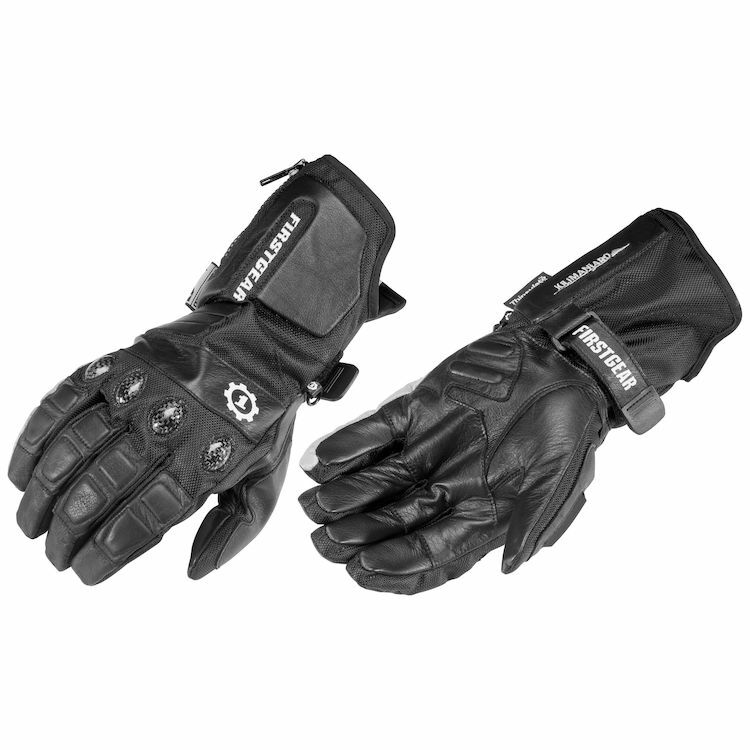 Gloves feel durable yet lightweight with no problem gripping the throttle. Looking forward to my ride to Denver with these in a couple of months. They are big!!!! I normally wear a XL, but had to return them to get one size down. Very comfortable and warm!!! I trust ordering from RevZilla. I have the Kilimanjaro coat and really like the quality for the price. These glove look like they will be a warmer glove and are waterproof but not overly bulky. I'm hoping they will still give me a good feel on my bike controls. Stromtrooper AND Advrider members both spoke very highly of these gloves for year round riding in all weather.